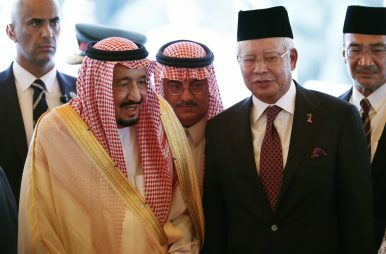 Saudi Arabia's King Salman, left, stands next to Malaysian Prime Minister Najib Razak during a welcoming ceremony at Parliament House in Kuala Lumpur, Malaysia (Feb. 26, 2017). When King Salman bin Abdulaziz Al-Saud of Saudi Arabia embarked on a month-long trip to Asia in February this year, Western media outlets led with incredulous stories about the monarch’s large entourage and their mountain of luggage. Traditionally obsessed with the desert kingdom’s human rights record and the state-sponsored brand of Islam, those same outlets took delight in touting the trip as a sign of Saudi economic weakness. An earlier version of this piece was published in the Brown University Political Review. Naishad Kai-ren is currently studying in the Schwarzman Scholars Program at Tsinghua University.